It’s a rather late night for me – as it has been for the past few weeks. But that’s not without reason, as a rather useful piece of equipment headed my way and my review was due. I had a blast reviewing the B&K Precision Model 8600 DC Electronic Load, and it helped me immensely with a project I will unveil shortly. 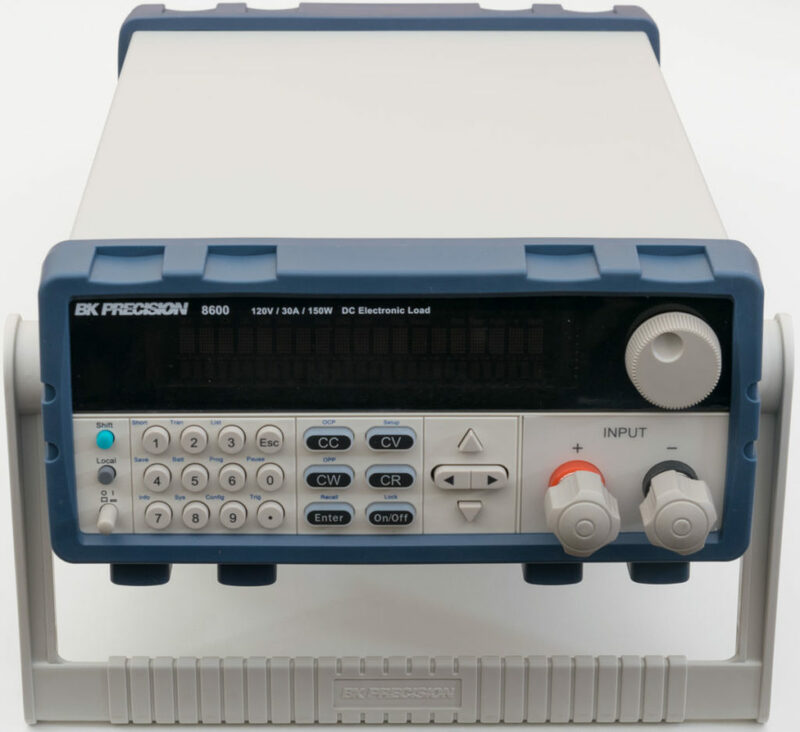 The B&K Precision Model 8600 DC Electronic Load is the smallest in the family, but is good value for money compared to its peers, with a full complement of features, software and connectivity, backed by a three year warranty. The unit’s range of 120V/30A/150W is quite suitable for many bench-scale investigations, and its transient load abilities and CR_LED abilities make it more useful. On standalone operation, the unit performed solidly. Basic features were easy to use, with all manner of input methods catered for. More sophisticated features did require consultation with the manual partly due to the limited display functionality, however, the manual was easy to understand and follow. The display is a fast, bright, contrasty VFD and although slightly flickery, is a delight. When PC-connected, the included software distinguished it from its competitors by being included, and fairly featureful, covering most application requirements. This means that users don’t have to spend their own time building their own test software using third party tools or “direct” communications. While the software is intended as “start-up” software, it is quite comprehensive. However, a number of basic bugs were identified and B&K contacted. To their credit, they followed through with my feature suggestions and bug reports and attended to them quickly, proving that they do have a competent and responsive support department. The Model 8600 proved to be my reliable partner in an investigation (soon to be published online for all), and managed to survive various forms of torture without adverse effect. Amongst the things I didn’t have a chance to test include the IVI/LabView drivers, as I don’t actually have LabView at the moment. I also didn’t have a chance to test how discharge rates affect Li-Ion battery capacity nor produce I-V curves of photovoltaic cells. I didn’t characterise any power converters using the unit yet, however, as I’ve won another RoadTest of an evaluation board – it’s something I will do fairly soon. The only flaws with the unit are a carry handle feels a bit weak, and the front panel connectors that creak slightly when tightened fully. Aside from that, the unit has been a solid performer, with all the features, connectivity, support and value we have come to expect from the B&K Precision name. Head over to element14 to read the full review! This entry was posted in Electronics and tagged element14, review, roadtest, test equipment, tested. Bookmark the permalink.